We’re currently 158 days from the Republican convention, and “Etch a Sketch-gate” will likely prove to be just as inconsequential. By the time the general election rolls around, the incident will most likely be forgotten. I agree and said as much on Twitter. But Kevin Collins then asked if this “gaffe” could the kind of thing that voters remember because the campaign emphasizes it. That’s possible. Maybe the Obama campaign will emphasize it. But “Romney as flip-flopping Etch-a-Sketch guy” may not be the most effective message. Here’s why. 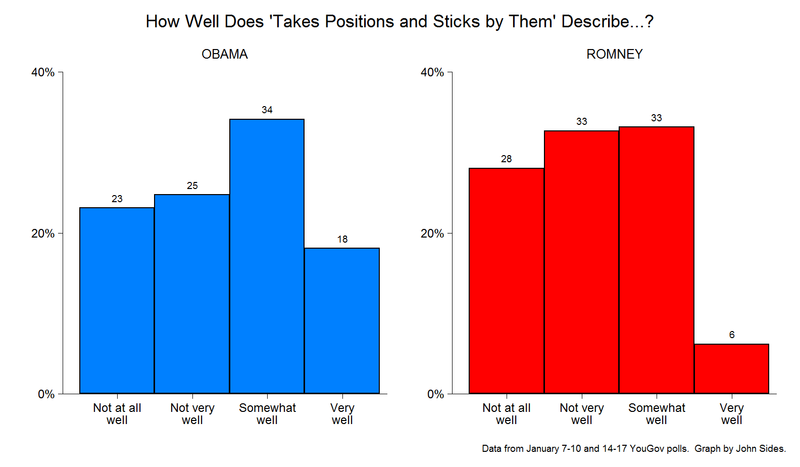 About 48 percent say that the phrase “takes positions and sticks by them” doesn’t describe Obama very well. But 61% say that of Romney. So far, so good for Obama. The question, however, is whether voters’ perceptions of “whose the biggest flipflopper” are as potent as their perceptions of other characteristics of the candidates. Consider characteristics like “cares about people like me” or “cares about the middle class”—qualities on which Romney is also disadvantaged relative to Obama. Which of these is the strongest predictor of vote intention in a Romney-Obama race? Using two January YouGov polls, I estimated the impact of different characteristics—takes positions and sticks by them, is personally wealthy, cares about people like me, cares about the poor, cares about the middle class, and cares about the rich—while controlling for people’s party identification. In particular, I took ratings of each candidate on each dimension and subtracted ratings of Romney from ratings of Obama. So these measures capture the kinds of comparative assessments that we think voters might make. Take a political independent who thinks that the term “takes positions and sticks by them” describes Obama “not very well” but describes Romney “somewhat well.” Assume their evaluations on the other dimensions are equal to the average of everyone else in the sample. Now pretend this person switches their view to one more favorable to Obama: “takes positions and sticks by them” describes Obama somewhat well but describes Romney not very well. What would happen to their chance of voting for Obama? According to the model, it would increase by 31%. But the same shift in perceptions of who “cares about people like me” would produce a much larger shift in Obama’s favor—61%. The same shift in perceptions of who “cares about the middle class” has a similar effect, increasing the chances of voting for Obama by 59%. The bigger conundrum for the Obama campaign is how to balance its two lines of criticism of Mr. Romney, particularly if he wins the nomination. Do they go the out-of-touch, protector-of-Wall-Street route or the flip-flopper route? These results—preliminary to be sure—suggest that people prioritize the candidates’ empathy more than their tendency to flip-flop. If the choice is between drawing Romney’s face on an Etch-a-Sketch or putting it on a $10,000 bill, I’d take the bill. 6 Responses to Would an “Etch-a-Sketch” Attack Actually Work? Yeah but when you’ve looked at enough of these kind of things you come to find out that the empathy dimension is ALWAYS one of the main drivers of the vote. I think it may be because it is tautological that someone who cares about about me and shares my values is going to do whatever it is I want or would do — by definition. These kind of traits are ill-defined and open-ended. They don’t tell you which thing they care about means they care about me and they don’t tell you which value the person allegedly shares that you also share. Therefore, I find the empathy dimension uninformative. It just pushes the strategic question back a step — the real question is what traits drive the empathy trait. Which things do you have to care about and which values do you have to share to be seen as empathetic? The etch-a-sketch thing could catch on. Or it may have enough juice that a good ad campaign like the one that showed John Kerry windsurfing in both directions could push the point home and help it catch on. What’s sauce for the goose may also be sauce for the gander. I think the Etch a Sketch question is very much a question of can Romney relate. Just as Nixon’s “I’m not crook” followed him to the grave so will Etch a Sketch. People ask themselves do I relate to someone that has flip flops and erases what was said before to would they do that. IMO most would not relate to a flip flopper or an eraser (Etch a Sketch) on issues they hold dear. The etch-a-sketch analogy was a fitting descriptive of Romneys lack of conviction and principles. The etch-a-sketch analogy may fade, but the long and permanent and well documented trail of romneys fluidity of opinion on the issues will last. It’s a matter of trust, and a man lacking conviction cannot be trusted in leading this nation. That is only one part of the entire picture painted by Romney himself. He is out of touch, arrogant and weak. The flip-flopping is just another piece of the puzzle illustrating the glaring weaknesses in Mr. Romney. Most days I’m left wondering how Mr. Romney stands upright without a spine. Real-time data. Awesome. But here’s my question: do any of these conditional correlations imply that a campaign message emphasizing empathy over steadfast positions would necessarily be more effective? 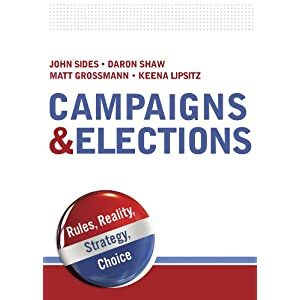 That speaks to related but separate questions about how malleable each of these beliefs is and how influential a change in these beliefs would be in a campaign environment. Dan: Fair points. We’ll try to return to “empathy vs. steadfastness” as the campaign goes on.